I’m a little bias for believing that this year’s North Park Festival of the Arts on Sunday, May 16th from 10AM to 6PM, will be one of the best festivals of 2010. Four years ago, I attended as a volunteer and thought the small one day festival could use a little work including representation of local bands, the involvement of North Park businesses and collaboration with the art community. After three years of hard work, the community is finally beginning to see significant changes for the better, especially regarding the involvement of North Park businesses. There are a number of contributing factors to the success of the Festival, but mainly it is due to the willingness of newer businesses to help make North Park and this festival the best that it can be. Say what you will about businesses that have left North Park in the past few years, but as cool as they were, they did not really contribute (both money and time) to North Park Main Street who coordinates this festival year after year. Craft Beer Block: Enjoy this miniature taste of North Park from noon to 6PM on Ohio Street, by sampling 8 tastes from San Diego’s thriving breweries/wine bars and 10 tastes from North Park’s finest restaurants. $25 in advance online or at the following participating North Park restaurants: Splash Wine Lounge, Sea Rocket Bistro, West Coast Tavern and Toronado San Diego. Limited tickets will be available on the day of the event for $30. Additional drink tastes will be available onsite for $10 for 8 tastes. This is a cash only event, so be ready. Also, we are still looking for some beer pourers, so let me know if you are interested. Quick Draw Event – “Plein Air” Painting Project: I personally think this is the coolest new addition to the festival. Registration for artists will be 9:30-10am at San Diego Art Department (SDAD) on Ray Street (all artists welcome to participate). The public is invited to watch participating artists during the Quick Draw event complete a “Plein air” painting within a two-hour time frame from 10am – Noon. The artists will be within walking distance of the Art Department, giving onlookers the opportunity to watch any or all the painters while the work is being done. The paintings, completed at noon, will be framed by each artist and displayed for public viewing on easels in front of SDAD. The works will be judged at 1pm by Stuart Burton. The wet paintings will be on sale from 1pm – 6pm during the festival. North Park Craft Mafia: This crafty crew has joined forces with the festival for the last few years. Make sure to stop by and meet the crew and see their Spring Line Up of Usual Suspects. Don’t miss the two fashion shows happening on the Main Stage in between sets, including one doggy fashion show right before Josh Damigo goes on. Hands On Art Area: This year, The Rare Hare Studios, Young Audiences of San Diego, McKinley Elementary Parent Teacher Club, and Outside the Lens will provide hands-on projects for kids and their parents to enjoy together. Enjoy origami making lessons, learn how to craft with recycled items, engage in multi-media and photography and take part in other fun interactive arts projects. Free Bike Valet: Velo Cult Bike Shop has teamed up with the San Diego Bicycle Coalition to offer free bike valet service on Iowa Street at University Avenue. The festival also happens to fall at the beginning of the Bike to Work Week. So ride your bike to the festival and park in the bicycle valet to receive 20% off your first beer in the Beer Garden, located on 31st Street at the Drowsy Maggies Stage or just do it for the environment. Plus!!! : Six stages with an eclectic mix of performers, juried arts, a whole host of things going on along Ray Street and a beer garden with a stage dedicated to the historic Drowsy Maggies (oddly enough, an alcohol-free live music venue). I will be roaming around with a walkie-talkie pinned to my ear. Come track me down to say “Hi” and have a few beers for me. 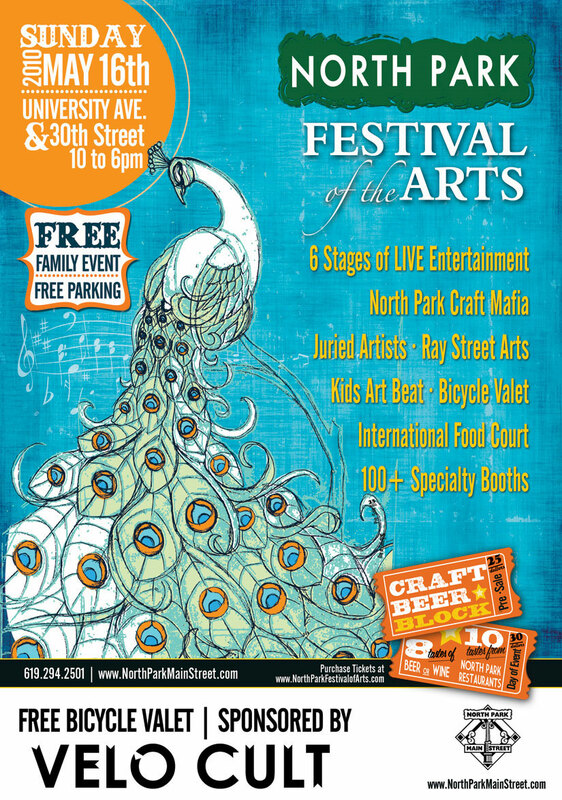 Note: Some information was taken directly from North Park Festival of the Arts press releases. I knew when you got involved in this a few years back thatvyou could and would make it better. Thanks for your effort in North Park.